Anxiety is a natural human response to stress and can be experienced in many different ways. However, feelings of unease or fear can become so intense they can be difficult to control and can affect day-to-day life. Depression can also affect everyday life due to feelings of low mood and helplessness. Anxiety and depression often occur separately, but can be experienced together. Causes also vary, for example, physical health concerns or life changes such as the death or loss of a partner. However, there isn’t always a clear reason. Recognising depression and anxiety in people with dementia can be challenging due to the overlap of symptoms (Dementia UK 2018). A change in a person’s behaviour or emotions, poor concentration, lack of sleep, apathy or restlessness can be associated with dementia, depression and anxiety. It is important the distinction is made to ensure the right treatment and support can be offered to the person with dementia and their family. Alleviating anxiety and depression will help improve physical symptoms, increase motivation and prevent social isolation. This is essential to ensure a good quality of life for the individual and the family. People experiencing memory problems may become anxious or depressed because they are afraid of what is happening to them and they may be worrying about their family and their future. It is important to understand what it is that is making the person feel the way they do and allow them time to express themselves. This can be more difficult for someone with dementia. To help understand what the person is experiencing and how best to support them it is important to listen to them and understand them in the context of their life and family. Active listening is a skill that requires a level of self-awareness and making a conscious effort to hear not only the words that someone says but, more importantly, the whole message being communicated (Rogers 1961). This will help identify potential triggers for the person’s low mood or anxiety and provide ways to offer meaningful reassurance. Involve family members and carers in your discussions; ask if they have seen a change in the person they are supporting and how long they have noticed this change. Using a relationship-centred approach recognises the significance of the triadic relationship (Adams and Gardner 2005), and the support informal carers provide. They may also need support to help them offer the best care for the person with dementia. Anxiety and depression can affect anyone. Pharmacological interventions can be offered to people with dementia who show signs of depression or anxiety. Antidepressant medications are advised by the National Institute for Health and Care Excellence (2018) for severe depression or anxiety, however, they are only advised for short-term use and should be monitored closely for effectiveness or negative interactions with other medications. More focus is given to the use of non-pharmacological treatments such as cognitive behavioural therapy or counselling. Both can be beneficial in the early stages of dementia. It is also important to consider people in the moderate to severe stages of the illness. What interests does the person have: these may not be the same as they had in the past? Trying new things can promote interest and interaction. 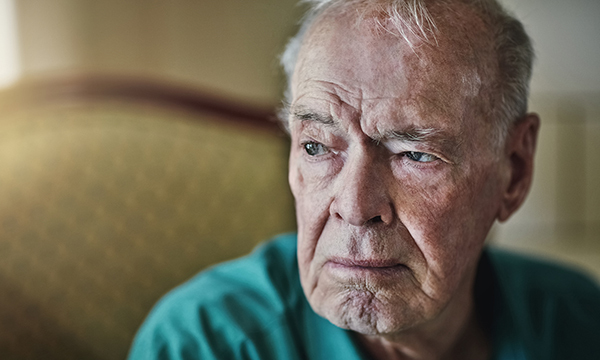 People with depression or anxiety and dementia may respond to a set daily routine, regular activities with others, physical exercise, or support groups where they can talk to others who have similar thoughts and feelings. Each person will be different, but for people with dementia and their families, these interventions could make all the difference to their well-being and quality of life. Adams T, Gardner P (2005) Communication and interaction within dementia care triads. Developing a theory for relationship-centred care. Dementia. Sage Publishing, London. 4, 2, 185-205. Dementia UK (2018) Managing Anxiety and Depression in a Person Living with Dementia. National Institute for Health and Care Excellence (2018) Dementia: Assessment, Management and Support for People Living with Dementia and their Carers. NICE guideline 97. Rogers C (1961) On Becoming a Person. A Therapist’s View of Psychotherapy. Houghton Mifflin, New York NY.